This International Women’s Day, we invite all women and curious minds who want to explore the creative aspects of technology. At ElektroCouture’s fashion technology studio, we’ll introduce you to the world of machines and electronics for fashion & product design. At different workshop stations, we’ll inspire you with the endless possibilities of digital fabrication and electronics. 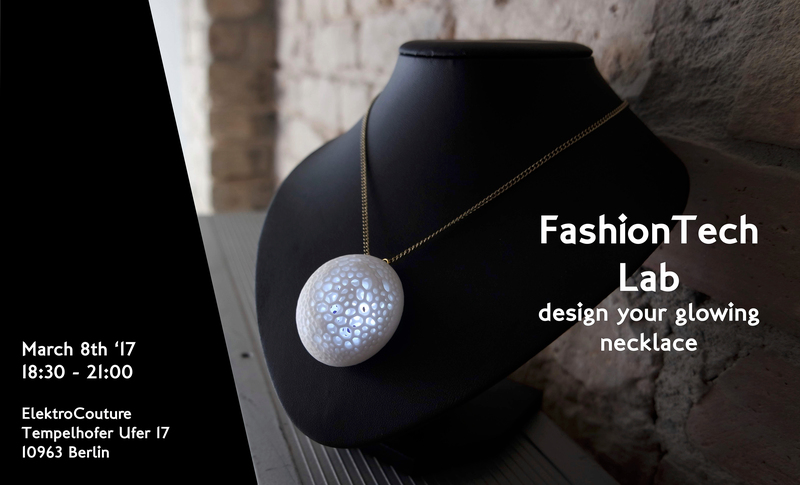 You’ll learn about basic electronics and soldering to create your personal glowing necklace with a 3D-printed Voronoi pendant. We’ll show you how to operate a laser cutter, so you’ll get the chance to laser cut your very own jewelry bag. Besides getting hands-on experience, you will get an insight into ElektroCouture’s FashionTech Studio and explore technology from a different perspective.